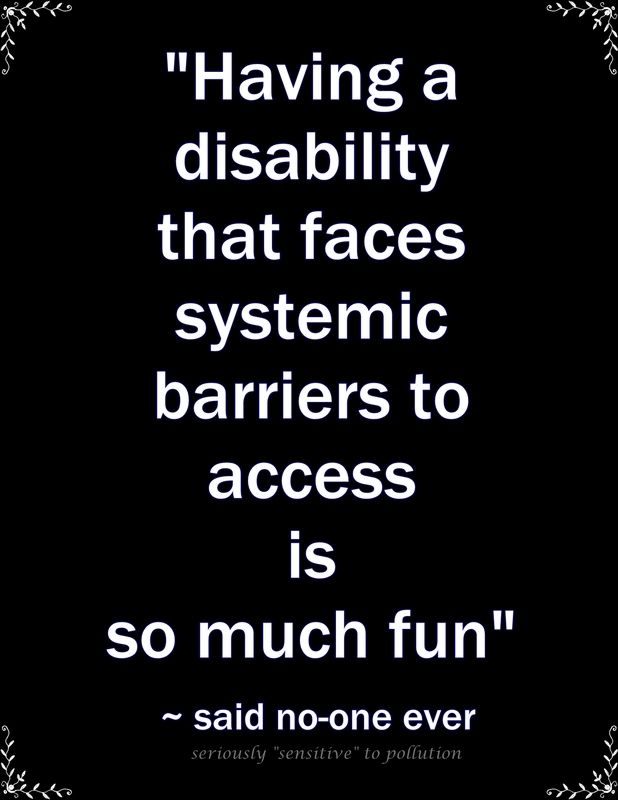 This entry was posted in Accessibility, Disability, Human Rights and tagged EHS, invisible disabilities, MCS, MCS/ES, sensitive to pollution, systemic barriers. Bookmark the permalink. My grandson’s fifth birthday is this month. He wants me to come but I can’t. On his 1st birthday I tried but three people showed up with scented products on or used them while I was there. I needed several shots of “demerol” to stop the migraine that I got. He told his mother that he wished Nana wasn’t allergic to everything. So do I. He told me he is going to cry forever when I die. I told him don’t worry about that Nana is fine. He said no you are not Nana you are very sick. What am I supposed to tell him. Why are we the ones who have to leave when others come polluted? Why are others coming polluted? Why are so many people becoming sick, disabled, and/or "allergic" to everything that has pollutants? Thanks for the hug Linda and one right back at you. I know how hard your life is and how much you do to educate and bring about change. I guess things won’t change until governments regulate toxins much better than they do now and people open up their minds. For those of us already suffering we can only hope for a cure and more compassion as we try and live as best we can in a world that has become very restricted. Apparently we have some Human Rights, and accordingly we are supposed to have equal access to everything (as opposed to having to be in isolation in our bubbles for crimes we did not commit, if we are even able to create a safe bubble). 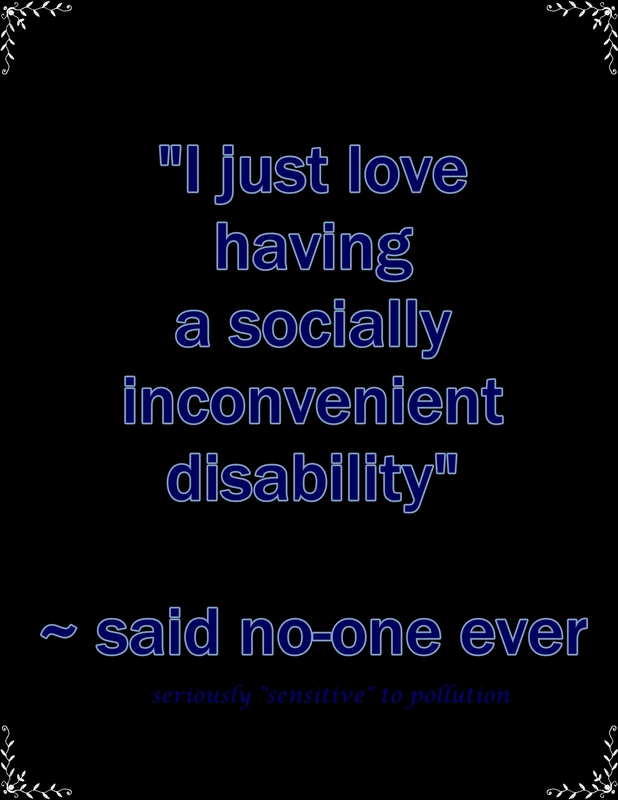 Sadly, because there is no “right to a healthy environment” in North America now, it’s becoming apparent that we (those of us who suffer disabling effects from pollutants) will be in the majority in the not too distant future. Yes we have rights but only if someone is willing to uphold them. Aside from my environmental doctor and my pain doctor I think more people are uncomfortable asking the “well” people from refraining. I believe I was targeted in 2007 and I have evidence. I am making a stand against those who took me from fairly mild MCS to a severe form (not the party guests). I am asking for protection from them and for them to pay some of the costs that may soon cause us to lose our home. It is justice or the public outing of them. I have had more than enough of industry that blames its victims and does not care what happens to them. This is hard to do when you are sick and of course they are aware of that but I will follow through and hopefully it will help others as well. Thank you for pointing out Colleen’s writing and her compassion. The many areas of our lives that are held hostage to the whims of others is staggering. May change come for us all soon. I hope and pray that you receive the strength and energy and whatever else you need to make things right. And that more and more people realize how they too have been injured (usually) for private profits, and that people develop the courage to speak up and out to stop the insanity, the belief that it’s ok to harm others, sometimes permanently, to keep a segment of the economy growing. So many are being injured or put at risk these days, just to cut costs and make more profits. “When manufacturing clothes, large amounts of chemicals are being used, about three kilogram for one kilogram of clothes. Many of these substances, like preservatives and substances to prevent mold, cause allergies. Some of these chemicals can cause cancer, or disrupt the hormone system, or even the human DNA, such as arylamines formed by azo colors. They are also harmful to the environment. …exposure to the types of pesticides used in flea collars may be linked to behavioural problems, cognitive delay and problems with motor development. Deborah, that breaks my heart. Thinking of you & your grandson. Tell your grandson you will live healthier and longer than other people because your body is smart and warns you when poisons that cause sickness are present. Thank you for your thoughts and concern Christa, Lyn, Linda and Colleen. I will be staying home and celebrating later with my family. My reactions can be life threatening because of my basilar migraine condition which can cause strokes and heart attacks. On good days I can go to pesticide free parks with him or a few stores that have lots of ventilation but it is rare. My grandson will refuse to leave my home when he is here at times because I can’t come. He knows so much about toxins and gluten that most people are surprised. I hope one day for all of us that change will come. Linda I passed on your links to my twitter and LinkedIn. Thank your for them. When we stand up for ourselves, we are standing up for others in our situation. Having said that, I’m pulling back on all social events (like, the 3-4 I attend per year), and spending the holidays with my partner, dog and the rabbits. Just knowing I don’t have to ask others to help me for the next month is calming just thinking about it–and, my health WILL thank me. I’m happy for you that you will have a calm and peaceful month! It does get tiring having to ask for accommodations all the time, year after year, after year, just to have our basic needs met, never mind anything extraordinary! I can’t count how many times I’ve done without or suffered serious consequences due to a lack of accommodation. It seems that for some people, ANY change in the way they do things is “undue hardship” in their minds, and to ask is to offend them (related to your other comment on the other post). Fortunately in some places, there are laws defining what is and isn’t acceptable, but sad that they have to be there. It’s really not that difficult to be kind to others.